Are you tired of winter and looking forward to spring? Give yourself a cheerful boost in a matter of minutes. 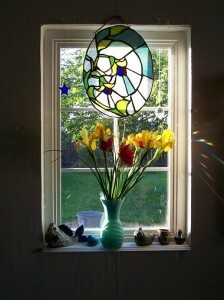 Choose a sunny window in your home that you glance through often. Buy a bouquet of fresh cut flowers or make your own using some of spring’s early bloomers from your own yard. Arrange the flowers in a favorite vase and place it on your sunlit window ledge. Tie a ribbon around the vase for flair. Or, select a few small potted herbs or succulents to accompany the vase. Finally, add a small figurine or statuary that contributes an outdoorsy feel such as a ceramic turtle or mushroom or a concrete bird. In no time at all you’ll have a charming window-scape to remind you that sunny days and warmer weather is just around the corner. We’ve all been there. Somewhere along life’s journey, we’ve all have at least one drawer, counter, shelf or room in our home that seems to attract clutter. Many of us have more than one of these spaces. If you are planning to build a new home, take some time to review and consider the organizational elements listed below. Each element helps eliminate clutter and keeps the whole family organized. 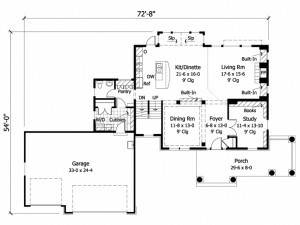 The House Plan Shop features many floor plans and home designs that incorporate at least one of these “de-clutter” elements. Drop Zone – A drop zone is a handy space usually positioned near the garage entry or mudroom giving everyone in the family a place to “drop” personal items when they enter the home. A drop zone is meant to organize everything from car keys, purses and briefcases to umbrellas, baseball gloves and jackets. Generally, a drop zone offers a locker for each family member or a hook and shelf/bin combination. Lockers are especially nice because the doors can be closed hiding everything inside. With the hook and shelf/bin arrangement, you can hang things such as a jacket and cap, and the shelf or bin is used for storing other items, like a backpack. With a drop zone, everyone will know where their belongings can be found keeping jackets off the floor, purses off the counter and soccer shoes out of the middle of the foyer. Cubbies in the Laundry Room – Laundry room cubbies are especially popular with larger families or in homes where the laundry room is on the main floor and all of the bedrooms are upstairs. Similar to the drop zone, each family member has his or her own cubbie or bin. This gives you a place to put clean and folded laundry allowing the children to pick up their own clothing and take it to their rooms to put away. This organizational idea will save you steps on wash day giving you a quick and easy place to store clean laundry without traveling all over your home to drop it off in its designated space. Also, it prevents leaving baskets of laundry all over the home. Using laundry room cubbies offers an added bonus. 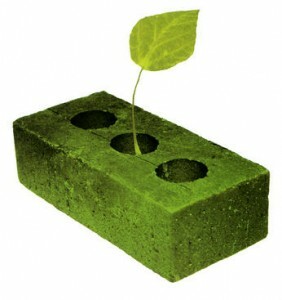 They encourage each family member to be responsible for their own things. Built-In Desk – Built-in desks are a common organizational element in many family homes. Most often they are found in or near the kitchen. Built-in desks provide the perfect place for a computer station allowing you to easily pay bills online. Place a small bin or basket on the desk to hold your mail. When it comes time to pay bills, everything will be in one place instead of strewn around the home with mail on the kitchen counter, in the bedroom and in the office. Other times, built-in desks are used for meal planning offering a great place for the family chef to review favorite recipes or look up new ones online. Overhead cabinets or drawers below work well for storing recipe books giving them a place of their own. Some families prefer to use a built-in desk as a charging station for cell phones, iPods, and the like. The desk is a safe place to leave these items as they charge and the drawers offer a place to tuck charging cables and cords out of sight when not in use. Next time you need to charge your cell phone, you won’t waste time looking for the charger. 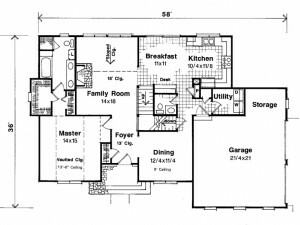 As you browse The House Plan Shop’s extensive collection of home plans and floor plans, keep these organizational features in mind. Choose a design that offers the organizational elements that will best accommodate your family’s needs. The House Plan Shop is introducing another new home plan collection: Unique House Plans. These homes are designed to stand out among all the rest showcasing one-of-a-kind features not found with most traditional house designs. 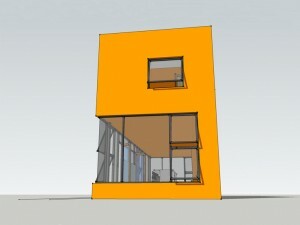 Many of the home plans in this collection feature a striking look designed to catch anyone’s eye. Furthermore, they are often created to accommodate specific requirements such as a hillside or sloping lot or to satisfy the owner’s particular needs or desires. Take some time to browse our Unique House Plan collection. 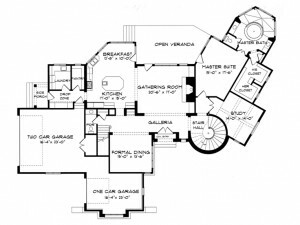 You’ll discover home plans with an unusual shape, a completely original style and elements that are out of the ordinary giving each house plan its own individuality.